Apologies for the silence on the blog lately. I’ve been trying to get caught up with work since I got back from the north woods of Michigan last sunday. However, I thought I should take a minute and mention the forest fires in LA that are threatening JPL . People on the MER team have been sending occasional updates and photos over the last few days as the fires inch closer to the Lab. Best wishes for those in the LA area affected by this fire. Stay safe! No homes are reported lost yet, and let’s hope no telescopes or NASA labs will be lost either! Emily Lakdawalla also has a post full of info about the fires over at the Planetary Society blog. As I mentioned last month, on top of research and grad school duties, I’m in the process of planning out a sci-fi novel. It began with the month-long outlining challenge “Midsommer Madness” over at the Liberty Hall writing site, and I am continuing with it in my spare time. I am trying to make my novel grounded in reality whenever possible. 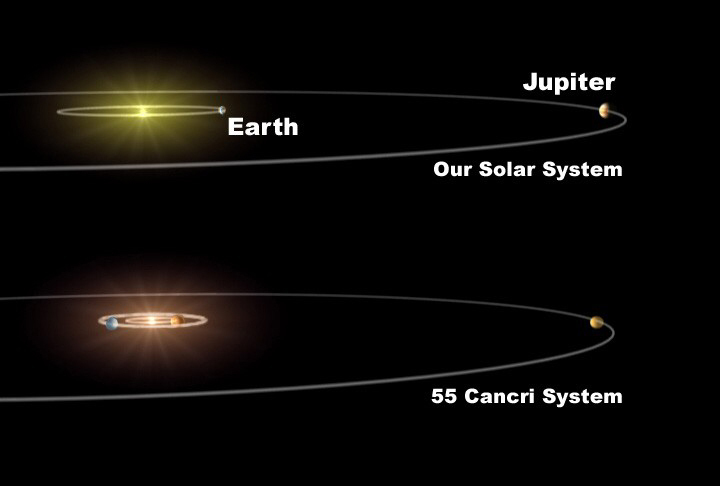 It is set in a known star system, 55 Cancri. The 55 Cancri system has 5 known planets, but I also took some artistic license and added moons and small planets that observations would likely have missed. Then, once I had planets and moons, I needed to figure out which ones would be habitable! I happen to know a thing or two about planets, so I put together a handy spreadsheet to use to calculate things like surface temperature, surface gravity and orbital period given things like how bright the star is, how far away the planet is, etc. Once I had the spreadsheet made, I realized that there are likely other people out there who might find it useful. So, whether you are a writer trying to come up with a plausible setting for your bestselling sci-fi epic, or a student learning about the solar system, or just plain curious about planets, please feel free to use and modify this spreadsheet. Right now it is set up for our solar system to give you an idea of what reasonable values are for the different variables, and to show that the results are generally pretty good despite the simplicity of the calculations. If you find this useful or have any questions, feel free to contact me by leaving a comment on this post. I described how I calculated the surface temperature below. You don’t need to read the explanation to use the spreadsheet: it should just work if you enter numbers, but I encourage you to try to follow the derivation. Even if you don’t follow the algebra, I tried to explain everything in words to give some conceptual understanding of the ideas behind the math, and the ideas are what matter. Note for Students: The spreadsheet is free for you to use, but be sure you cite this page as a source. Also show your work for all calculations! Copying values from the spreadsheet without showing your work probably won’t earn you any points, and may be considered plagiarism, which is grounds for failure and/or expulsion at most schools. And really, it’s not that hard to do the calculations, especially since the rest of this post is spent walking you through them! You might even learn something! Ok, so how does it work? Well, the calculation of a planet’s surface temperature is based on the very simple idea that if its average temperature is not changing, then the amount of energy the planet absorbs must match the amount that it emits. Pretty much common sense! If the amount in and out were different, then the temperature would change until they balanced! The planet’s cross section is just the area of a circle with the planet’s radius: . Note that we’re using the area of a circle and not a sphere! That’s because the starlight doesn’t hit the whole planet, it just hits the part of the planet that is visible. Can you see all sides of a sphere at once? Neither can I, and neither can the star. What we see is the 2 dimensional cross section: a circle. Now we have to figure out an expression for the energy that the planet emits. Here we have to make an assumption to simplify things: we assume that the energy absorbed by the planet is immediately redistributed evenly over the whole planet. Obviously this isn’t right, it is much warmer on the day side than the night side, but this assumption makes our lifes much easier. We just have to remember that the value we get is going to be an average of day and night temperatures. We also assume that the planet radiates away its energy like a blackbody. A blackbody is something that absorbs and emits all radiation perfectly. We’re not going to worry too much about this assumption. For our purposes, planets are close enough to being blackbodies that it doesn’t matter much. I know, I know, we just made an adjustment for albedo two paragraphs ago, implying that the planet is not a perfect blackbody! Just calm down. It works pretty well, and that’s all we need. Now that’s a fine equation if your planet emits every bit of energy that it receives straight back to space. But that’s not how it works for planets with atmospheres. There’s this effect where the atmosphere traps energy in the system for a longer time, resulting in a warmer planet… you may have heard of it: the Greenhouse Effect! It would be nice if we could add that to our model! If we don’t, we’ll never get the surface temperature right for a planet like Venus, where the greenhouse effect dominates. Look! The planet’s radius appears on both sides of the equation! That means it cancels out, and that a planet’s radius has no effect on its surface temperature! Ok, don’t get too excited, we still need to solve for T.
Voila! There is the expression for the equilibrium surface temperature of a planet, taking into account the planet’s reflectivity and the greenhouse effect. I hope this sheds a little light into how to think about the energy budget of a planet, and how my spreadsheet works. Again, if you have any questions, post them in the comments and I’ll answer them! What better Earth day message is there than this? The Big Picture, an awesome photo-blog that you should be reading, has a very cool set of photos of the Mount Redoubt eruptions in Alaska. I thought it was especially cool to see how the glacier on top of the mountain is collapsing as it melts from beneath. The answer: on average, volcanoes produce less than 1% as much CO2 as fossil fuels do. I’m starting my first day of work at Johnson Space Center today, and coincidentally, I just came across this awesome photo of the International Space Station. It seemed fitting to post it since I’m going to be about a block from mission control. 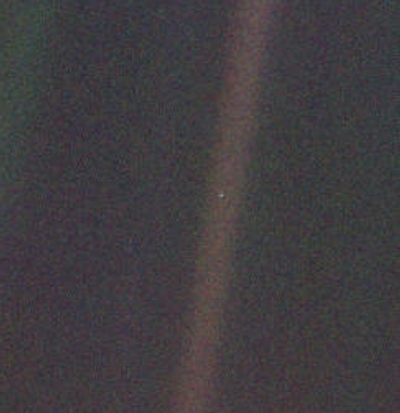 The ISS may have its critics but you can’t deny that this is an amazing photo of an amazing human achievement. The colorful layers of the painted desert formed in the triassic period when meandering tropical rivers deposted layers of mud and clay. Some of these layers are due to volcanic ash choking up the rivers and altering to clay. Friday was the last day of the field trip, and we spent it at the Petrified Forest national park. We were there to study the colorful clays and river deposits, but we began the day with an unexpected bonus: our guide, Bill Parker, is a paleontologist at the park, and he took us to see some of the skeletons that have been found there, and the people who work on them. I spent much of my childhood wanting to be a paleontologist, so to actually see it in action was a special treat. We learned that there is recent evidence that almost all dinosaurs had feathers! We also got to see the reconstruction of what one of the animals may have looked like based on the skull, which was something that I didn’t realize that paleontologists did. Matt Brown, a fossil preparer at Petrified Forest national park chips away at the protective plaster around the skull of an alligator-like dinosaur. A reconstruction of what one of the dinosaurs being studied at the park may have looked like, based on its skull. After the paleontology lab, we continued on to the painted desert badlands, which were the real reason we came to the park. These beautiful formations were formed when Arizona was a flat, tropical floodplain. Many of the layers are actually the deposits from broad, meandering rivers. When they overflow their banks, they deposit sediment in broad layers. In other cases, ash from volcanic eruptions blanketed the landscape, and was altered by the water of the lakes and rivers and rain to become clay minerals like bentonite. The clays expand when they get wet and contract when they dry, and are quite soft to begin with, so that it is very difficult for plants to get a foot-hold. This leads to broad expanses of “badlands” terrain: heavily eroded buttes and mounds of the brightly colored clays and sandstones. The badlands terrain of the painted desert. The clays in the rocks expand when wet and contract when dry, creating an unstable surface where plants can't get a foothold. The bright colors are from different types of clay, different types of deposits, and different degrees of oxidation. We spent a long time studying an outcrop that used to be part of an ancient meandering river or delta. The layers deposited on the shore of a river tend to be angled in toward the riverbed, so by looking at the orientation of thelayers, you can guess at what the river might have looked like. Clay-bearing river or delta deposits. These may have been deposited extremely rapidly, since there was the fossil of an 8-foot-tall horsetail in the outcrop, still standing upright and crossing several layers! We were especially interested in this outcrop because we found fossils of giant horsetail plants in them, and the fossils were upright, as if they had been covered in sediment while still alive. That would mean that something like 8 feet of rock was deposited extremely rapidly, before the horsetail died and fell over! We speculated that this could happen during a particularly heavy monsoon season. In the layers with the horsetail there were also some very large rocks that were rounded as if they had been transported by the river. Jeff Martz, one of our paleontologist guides, pointing at the two giant horsetail fossils. Click for full-resolution to see the fossils more clearly. A close-up of one of the horsetail fossils. The green part is a couple of inches across. After puzzling over the river deposits and trying to reconstruct their story, we ended the visit to the park by taking a look at the petrified forest. Our guide, Bill Parker, told us that all of the petrified trees in the park are missing their bark and branches, and that they likely were part of log jams in ancient Triassic rivers. He pointed out that it is almost impossible to find a modern river that hasn’t been modified by humans, and that in their natural state, these meandering rivers would have been clogged with dead trees. When the trees were buried by sand and ash, the silica in the rocks was dissolved in the water and precipitated out in the cells of the wood, gradually replacing organic matter with silica. The silica logs are much more resistant to erosion than the sandstone in which they are embedded, so as the rock erodes away, the logs are left sitting on the surface. Petrified logs, formed when silica replaced the organic material of the wood, are more resistant to erosion than the sandstone in which they formed, and end up lying on the surface. You may be wondering what all of this has to do with Mars. Well, the paleontology has very little to do, but the processes involved are quite relevant. Mars likely had liquid water in its past, and certainly had ash and sand deposits. Places like Mawrth Vallis have clay-bearing rocks eroded into channels and buttes and mounds, very similar to the clay-bearing rocks of the painted desert. The same conditions that prevailed to preserve the petrified forest and the dinosaur and plant fossils may also preserve more basic biomarkers, capturing evidence for a habitable Mars. That concludes our geologic tour of Arizona! I went the first version of this trip two years ago, and then as now I was humbled by how complex and difficult to interpret our planet is, even when we can reach out and touch the rocks and analyze them at our leisure. On the other hand, there were many things that we saw from the ground that were much easier to interpret from aerial and satellite data. When you’re on the ground, it is much harder to get an feeling for the overall shape of what you are looking at. A combination of both orbital and ground-based studies is very important to really begin to understand the geology in detail, and even then there is a lot that we can’t figure out! This trip has also impressed upon me how much more geology I need to learn. I need to know sedimentology and stratigraphy if I’m going to be attempting to read the story hidden in the layered pages of rock on Mars. But for now, I at least know what it is that I don’t know, and that’s a good start. Today was all about volcanoes. We started early, driving north out of Flagstaff and skirting around the huge San Francisco peaks, which are the remnants of a huge stratovolcano (think Mt. Fuki or Mt. Rainier). The volcano formed between about 1 and 0.4 million years ago. It is currently 12,633 feet high, but in its pristine state it may have been several thousand feet higher. This is because it lost its peak, either by an explosive eruption or by erosion. You can imagine its profile by mentally extending the slopes in this photo up above the mountain to meet at a sharp summit. In the background are the San Francisco peaks, the remains of a huge stratovolcano that has lost its peak either due to an explosive eruption (like Mt. St. Helens) or erosion. Somewhat closer is an eroded cinder cone with a very broad crater. This photo was taken from the rim of SP Mountain, another cinder cone. Our main destination today was SP Mountain, a pristine cinder cone volcano with a spectacular lava flow extending four miles from its base. Cinder cones are volcanoes formed by loose rocks called cinders. As they spew forth from the vent, the cinders form a pile that gradually grows to become a cone. The class had been given various satellite and aerial imagery of the SP mountain and flow, and made geologic maps of the area. Today we actually got to go out in the field and test their hypotheses. This activity was modeled after the same one that I did in Hawaii last summer, and it’s a really great way to realize just how complex geology can be and how difficult it is to interpret things with just satellite imagery. It’s humbling to realize how wrong we are in interpreting things even on earth, just think how much we must be getting wrong about Mars! A view of SP mountain, a ~1000 foot tall cinder cone. You can see that the rim is capped with solid rock, but most of the cone is loose chunks of volcanic rock, ranging in size from small pebbles to huge boulders. It's quite an exhausting climb! Cinder cones form when lava erupts that is full of gases, which expand as they reach the lower pressure of the surface (much the same way that a bottle of soda will shoot out when opened too fast), causing the lava to fracture into chunks that are blasted into the air, cool, and pile up as rubble around the vent. Gradually this builds the cone, but it also uses up the gases in the lava chamber, so it is common for cinder cones to be followed by a flow of less bubbly lava that emerges from underneath the cone. There was some confusion today because some people thought they had read papers that said the SP flow formed before the cone, so I don’t know for sure what the exact series of events at SP were. The term cinders refers to small chunks that have flown through the air and mostly cooled before they landed, but not all the chunks are small. Some, like the one in the picture below are much larger, and are called “bombs”. These often are spindle or football-shaped, because they form when a blob of lava is flung up from inside the crater, stretching it like silly putty until it breaks. This large "bomb" is a lava rock that was launched from deep inside the SP crater, flew through the air and landed near the rim. It has an elongated shape because it stretched out as it was flung from the vent. Note my pocket knife for scale, and there are many bombs much bigger than this one! SP is a pretty young volcano, but nobody is sure exactly how young. One method, which looks at the amout of argon formed as radioactive potassium in the rocks decays, indicates that it is something like 71,000 years old. But another method that relies on the luminescence of certain minerals under UV light, indicates that the cone may only be 4000 years old! The lava flow is very rugged up-close! (note the geologists for scale) The lava in northern Arizona tends to have more silica in it than the very fluid hawaiian basalts, and more silica means that the lava in Arizona is more viscous. It forms much thicker, blockier flows than those seen in Hawaii. After spending most of the day at SP, we did a brief stop at Sunset crater, the youngest volcano in Arizona. It erupted about 1000 years ago, when people were living in the area, and the remains of houses have been discovered in the lava flows. Most of the features of Sunset crater were similar to SP, although its lava looked a little bit more fluid than the SP lava. Sunset crater gets its name from the layer of red oxidized cinders near the top. Sunset crater, the youngest volcano in Arizona, erupted about 1000 years ago. That’s all for today. Stay tuned, because tomorrow is the Grand Canyon!